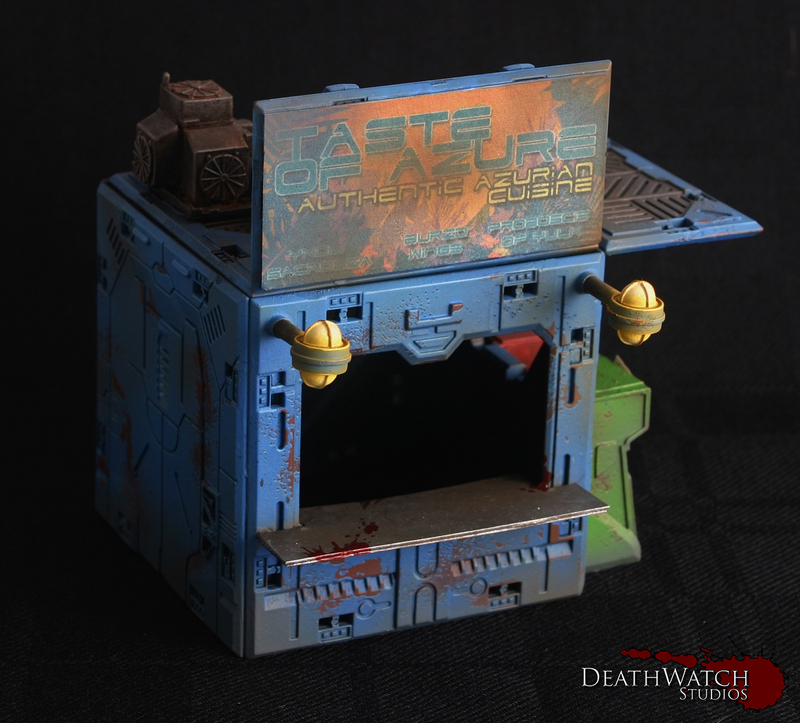 Deadzone – Cafe Terrain Finished! 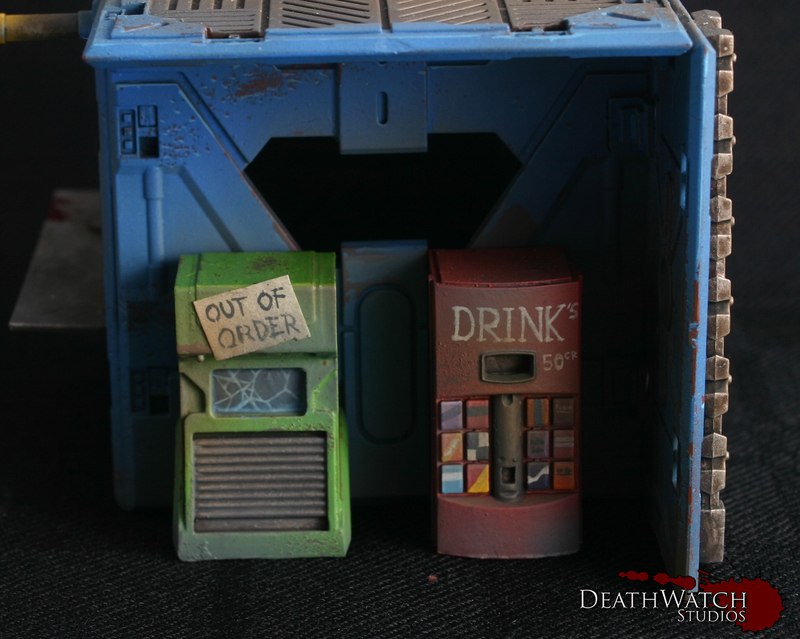 I’ve been working on a few terrain pieces with a bit more of a story to them for Deadzone. The reason behind this is with what I have it feels like a very industrial hollow battlefield, and as each deadzone is supposed to have been something; Military compound, newfound colony, sprawling colony etc. I wanted to get that across with the terrain. I’m very pleased with how it’s turned out, and it looks good setup with the other terrain. 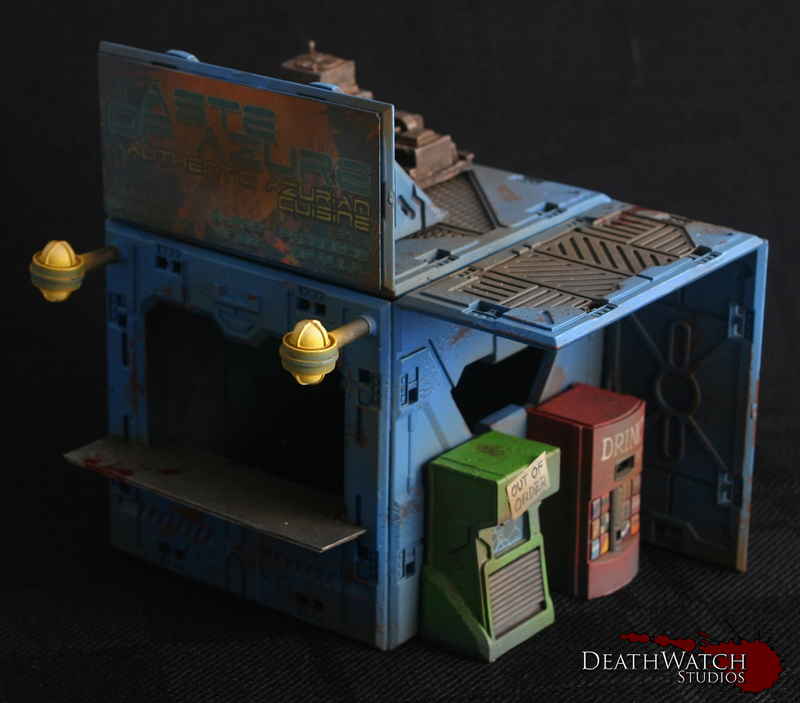 ← Deadzone – Buildings with Character! Are the vending machines Ainsty? I don’t want to say it, but god that’s cute! 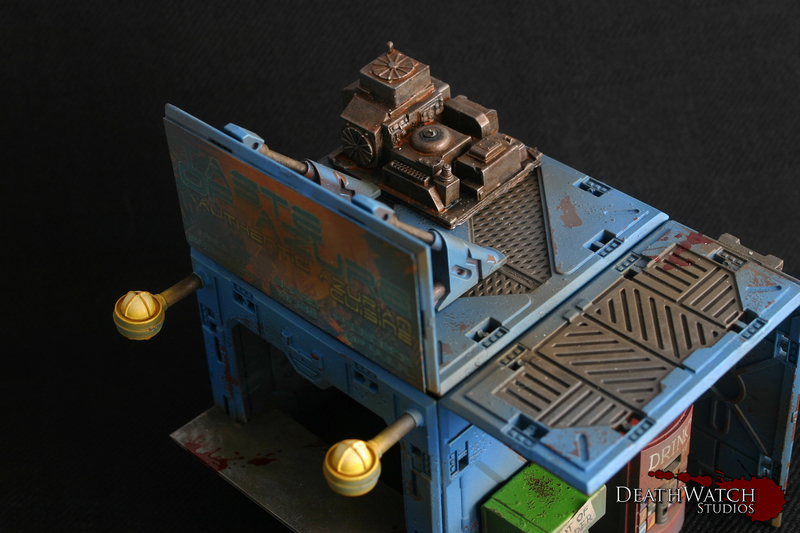 I’ve been building more realistic buildings with my Deadzone terrain too. The “paint ball arena” might suit the rules, but it kind of makes you wonder what function it used to have and makes it a bit weird for other games. So far I’ve got a few generic office blocks, a bar and a few shop shaped buildings, although the shops still need some detail as they’re pretty bare (looted?) at the moment. It’s good terrain for creating stuff though and fits in nicely with Mercs, Infinity and so on. It’s how I felt playing the first couple of games – where are these guys fighting? What was this place used for before the containment protocol? I’m a story gamer at heart so it made sense to create that sense of ‘somewhere’ for the games I play. I had trouble with the bar as to what should be inside(hence why I chose to have it burned out and boarded up). The next thing I want to tackle is the insides of buildings as they seem a bit useless being empty, have you found or made much for building interiors? I’ve picked up a few bits of interior terrain over the years that I’ve tried to keep neutral for various uses. I’ve got all the Antenocitis Workshop stuff, so I’ve got a drop in “street doctor” style setup, with the interior painted as a worn clinic. I’ve used some crates, a few terminals and a modified toy forklift model to make a warehouse / storage / drop box style depot too. The General Store came with some shelf units, a counter and some cupboards which I’ve kept neutral so they can give cover to Enforcers and cowboys alike. It also sparked my imagination into working on a bank and some sort of futuristic police station too. I’m loving your dreadball pitch. There’s football goals and play grounds all over now days so why not dreadball! 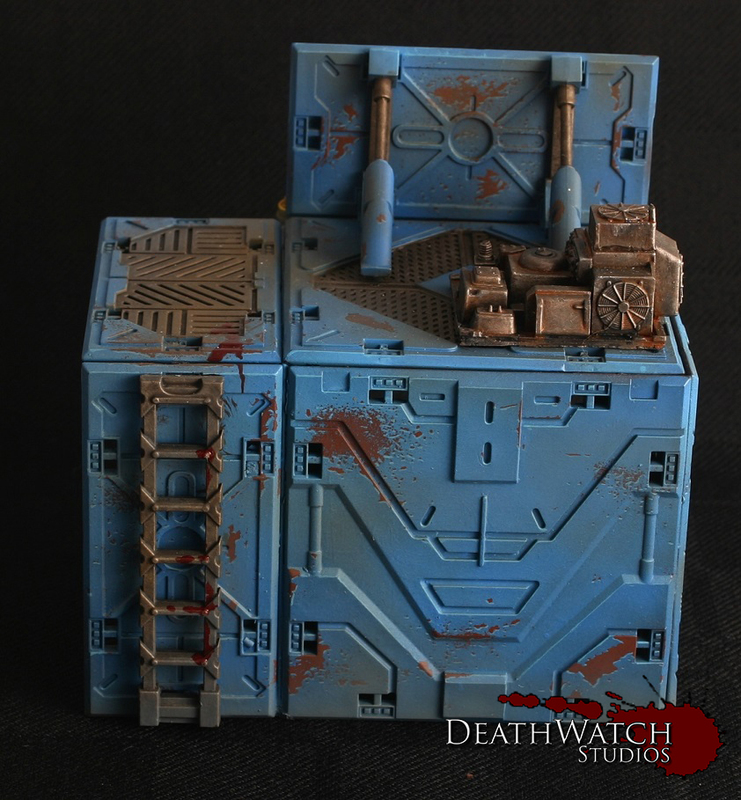 Do you play anything other than Deadzone with your terrain or is that it’s main use? Wow, that’s a lot of cool stuff and some great inspiration for me, thanks :). Particularly like the idea of a place of worship and a police station.